Candidates can get the subject wise Kerala High Court Munsiff Magistrate Previous Papers from this article. And also the officials of the Kerala High Court are soon going to commence the written examination for the candidates who applied for the 45 Munsiff-Magistrate Posts Vacancies. You all need to make a note that the officials are going to organize the test tentatively in the month of March/ April 2019. 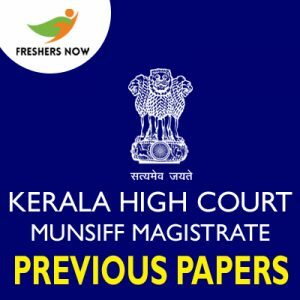 Furthermore, check this current article to grab the complete information and the particulars of the Kerala High Court Munsiff Magistrate Selection Process, the Kerala High Court Munsiff Magistrate Exam Pattern for Prelims, Mains in detail. Moreover, these Kerala High Court Munsiff Magistrate Sample Papers assist you to know the level of the questions appears in the കേരള ഹൈക്കോടതി Munsiff Magistrate Test 2019. So, download the KHC Munsiff Magistrate Model Papers PDF from the direct links available at the end of this page. Well, candidates who have applied for the KHC Recruitment 2019 must and should know the Kerala High Court Munsiff Magistrate Selection Process 2019 for sure. So that they can know the next procedure in the whole procedure. And there are three rounds where the authorities hire suitable, talented ones. We have given the latest Prelims, Mains Exam Pattern in the tabular fashion as visible below. So, start preparing for the test with the given details. Candidates who got selected in the preliminary examination they will be called to attend the Kerala High Court Munsiff Magistrate Mains Exam. The Mains Examination consist of the 4 papers and each paper is conduct for 100 Marks with the time duration of the 3 Hours. For more information check the below provided table. Candidates who are ready to face the competition need to utilize the given information regarding the selection process, test pattern and the KHC Munsiff Magistrate Model Papers PDF’s. So, with the help of the furnished Kerala High Court Munsiff Magistrate Previous Papers, you can easily know what level the question is and also the weightage of the paper. Solve more and more questions given in the Kerala High Court Munsiff Magistrate Sample Papers to attain more marks in the test. Hope all the above given Kerala High Court Munsiff Magistrate Previous Papers PDF’s will help you during the preparation process. So, do make your time with us on FreshersNow.Com to get all the updated information.